As I’ve done for a few years, here is the updated graph for the Nenana Ice Classic competition, which tracks the break up of ice on the Tanana River near Nenana in Alaska. It is now a 101-year time series tracking the winter/spring conditions in that part of Alaska, and shows clearly the long term trend towards earlier break up, and overall warming. 2017 was almost exactly on trend – roughly one week earlier than the average break up date a century ago. There was a short NPR piece on the significance again this week, but most of the commentary from last year and earlier is of course still valid. My shadow bet on whether any climate contrarian site will mention this dataset remains in play (none have since 2013 which was an record late year). Has anyone ever published a study of the effectiveness of the Mark 1 Eyeball for trend detection, and how strongly its accuracy is affected by having a big outlier spike at either end of a time series? I’d just bet that taking that chart showing the red line, without the blue line for the trend, and asking the traditional classroom full of undergraduates to eyeball the red line and draw the trend they see over it would be, well, revealing. Then compare Harvard, George Mason, and Rural Religious College student groups …. Any, what, sociologist? psychologist? out there with a grad student looking for a thesis? I wish we could get the political component out of the work of science or more precisely out of science funding and support. The validity of AGW is there in th.e graph, and that point in time of 2017, but one difference is in what Putin, et al. have contributed to this discussion. 2016 was really really different from 2017 It may not ake 50 years from now for the graph to depict a slight downward change or beginning of a flexure and slope steepening pointing at changes initiated in 2017, because the Game had a Trump introduced — but it might. With the Russians conspiring to help[!] defeat Hillary, the Climate “game” gets a Trump. That Trump denies the graph of Nenana. Yet what if history as read 50 years from now shows a deflextion hinting the politics of the moment? I would enjoy the Climate Bridge Game with 10 or 12 years of No Trump. A no trump configuration to keep from backstepping what the executive orders and appointments to solid Government Science has done to the world. I mean that. Can Gavin anc the realclimate team continue to publish in this venue or with Trump in the game has there been pressure to shut this site down? I don’t know if anyone here follows TRMS [Rachel Maddow] but her show this evening highlighted the trail of dea Russians and I went ahead and advised the chief of the Office of Government ethics to get himself and family some form of nearly secret service or U S Marshall protection. How well secured are our champions at RealClimate? No pressure on you, Gavin? Yet? And the uncertainty on the gradient of your fitted trend of 7 days per century is…? I’m not an expert, but I have worked on data visualization software and I believe you make a good point about the perception of large spikes. If we consider a section of the plotted red line as a planar region, its center of mass does not correspond to the center of mass of the data points. For example, a line graph through the three coordinates ((0,0),(1,0),(2,0)) has a total length of 2, while a line graph through the triple ((2,0),(3,10),(4,0)) has a total length of slightly over 20. The center of mass of a line chart through those five points has a y value of about (20*5 + 2*0)/(20+2) =~ 4.5, but the average y value of the five points is 2.0. That doesn’t mean the perceived center corresponds to the center of mass, either, though. Anecdotally, I believe most people who look at open equilateral triangles with flat bases used as data point markers in a graph will assume that the value being represented by a given triangle lies not at the triangle’s center of mass, one-third of the distance between the bottom side and the top vertex, but instead at a point a good fraction of the distance up from the center of mass to halfway up the triangle. But it’s fair to suppose the center of mass influences people’s perceptions. Henry, Google: Robert Grumbine on detecting trends. He explains the arithmetic you need for that. From his comment, I’m betting Henry has no idea how linear regression works. This is valid argument as long as you convince skeptics that upriver Fairbanks growth has nothing to do with it. A singular nuclear power plant heat exchanger can warm up the river downstream to cause the observed effect. OK, assuming this 7 days/century trend is correct, is it “catastrophic”? @tegiri nenashi: “a singular nuclear power plant heat exchanger can warm up the river downstream to cause the observed effect”. But this singular nuclear power plant should have worked at increasing power during last years, with a peak of intensity in 2013, since the warming trend is continuous! “upriver Fairbanks growth has nothing to do with it”: upriver Fairbanks has grown certainly during last decades (https://en.wikipedia.org/wiki/History_of_Fairbanks,_Alaska – with a positive trend of 400 more inhabitants per annum), but that city is located about 60 miles upriver, not just a few miles… 60 miles may equival to one day in time. In 60 miles, eventual possible warming effects caused by a small city of 30000 inhabitants, if ones, will still remain evident? While the regression trend line of 7 days per century is certainly accurate, based on the data, it should be noted that all of that change occurred over a roughly 30-year period from 1970-2000. The trend over the first 50 odd years is flat. The trend since is nearly flat (within error). With regards to Fairbanks, the city experienced its greatest growth from after WWII to about 1990, when the population grew from less than 5000 inhabitants to 31,000 (1990 census). The population has changed little in the last quarter century. While it may be true a nuclear power plant on a river can warm the waters downstream for quite a distance? It can’t warm the waters in a totally different river. The river going through Fairbanks, Alaska is the Chena, not the Nenana. The Nenana river sources from a glacier and flows into the Tanana river. My eyeballing sees a recent increase in the lateness. Since the early 1990’s the graph takes a turn upwards. What’s this supposed to be telling us? Not to have confidence in what the error-prone brain sees on a graph with the Mark I eyeball? It’s why climate science uses statistical methods. Doesn’t look statistically significant. The droop from about 1977 to 1980 seems strange. I do not remember warm winters in Fairbanks during that period. 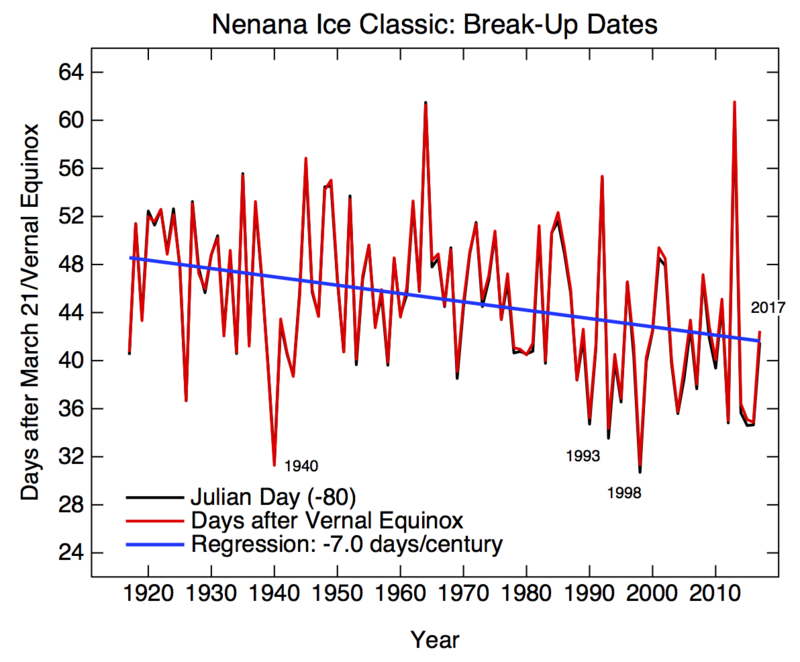 Of course Nenana where breakup is recorded is not Fairbanks, but I’d expect similar heating degree days fluctuations. However, a sudden heat wave in March, particularly if it included significant rain, or sunnier than usual weather might play a part in earlier breakup. Also, stream flows probably play a part, as well as snow received during the winter. More snow early in the season would likely reduce ice thickness over the remainder of the winter. What part did that pesky arctic warming which occurs periodically regardless of CO2 levels play in the breakup date? The graph is meaningless without a LOT more data. Oh well, so much for the graph which shows 2013 as having the latest breakup. The 1915 and 1919 high temp data are contrary to AGW theory when CO2 was much lower than today. A horizontal blue line at 46 days, would fit well up until 1990. Another blue line at 41 or 42 days would fit from 1990 to 2017. For all we know, the higher gold prices since 2006 may have caused miners to blast the ice so they could get started mining early! I’d do it if I had a gold mine! Also, the stock market crash of 2000 could have started more folks mining since they lost their jobs. Ditto the crash in jobs/oil prices lately. You may have described the nuts and bolts of the Nenana observation methodology in the past, but Alaska Dispatch News has a nice article from a writer who says he’s been covering this for 40 years. He was allowed up into the tower where the official clocks are. Can’t have a trend without measurements. The Chena is a small tributary of the Tanana, which flows through the center of Fairbanks in to the much larger Tanana River, which flows past the southern edge of town. The Nenana river flows into the Tanana at Nenana, but downstream of the Nenana ice classic location. The ice classic contests is based on the ice breakup of the Tanana River at Nenana. Your eyeballs are quite correct. The linear regression of the breakup date since 1990 is -0.013 days/year (-1.3 days/century), with a very large uncertainty. This is significantly lower than the posted century-long trend, and more than an order of magnitude lower than the regression trend from the previous quarter century. Here is a correlation between the ice breakup date and springtime temperatures. A lot of the rebunking sites pander to the Mark One Eyeball. Put something like this into a Google search — click “Images” to filter the result. Notice how the bunk sources dominate what’s found. They’re not trying to convince people using words. They’re playing to the eyeballs. I’m afraid that’s what the rebunkers learn from studying statistics: that it’s easiest to fool people with pictures. says “…to guess the exact time the Tanana River ice will break up…”. To doublecheck, look at the photo. The tripod location is just in front of railroad bridge. You can see that bridge across Tanana next to confluence of the two rivers on google maps. To add to my previous reply to comment #11 by Miles, Chena river is a tributary to Tanana. , which probably work with closed cycle (with no discharge into ether to Chena or Tanana). To summarize, the effect of relatively populous city 30 miles upstream is unclear, but can’t be dismissed without further investigation. Writing in small increments, sorry. Granted, it is not on nuclear power plant cooler scale, but is not something to easily dismiss. Next year April 18, 2018 – put me down for 10 bucks. You do realize that would break the 77-year old record by a full 2 days! Last year was the fourth earliest on April 23. The break-up date does show a correlation with ENSO, with the earliest dates (1940, 1998, 1993, 2016) occurring during El Ninos. Whose absolutely braindead idea was it to plot these timelines with a 30 deg range on the y axis? Could have been a climate “skeptic” according to the intellectual performance. it confirms how easy it is to see *what you want to see* IF (great big gigantic “if”) you are willing to ignore context and make claims (rather than suggest possibilities) based on no real evidence. In particular, you can almost always (really) find a time span giving the slope you want, but only by ignoring what happened before and/or after. Alas, too many scientists don’t know how to do this right either. See Rahmstorf et al. for some context about this issue. As for the eyeball, it’s great for getting ideas but not for confirming or even testing them. We’re just too likely to see “pictures in the clouds” and think they’re real. Those who reach a mistaken conclusion on this basis might be genuine skeptics. Those who are *shown* how wrong a particular claim is but still cling to it, are deniers. Those plots are from British Antarctic Survey. The temperature variability of those 2 interior station is indeed minuscule compared to the range. I suspect they somewhat sloppily made the same range to fit all the stations. Admittedly, Antarctic Peninsula stations exhibit much larger variability, and perhaps even some trend. However, I would suggest that we simply trust less to the stations with large variability. And the reason for small temperature variability of those interior stations is quite obvious: the non-existing daytime temperature variation, and uniform land (pardon, ice) stretching in all directions. Unlike peninsula stations they are not on a whim of shifted ocean current, or some such. #26 would you care to give an exact reference to the source, where this plot is from? I would suggest to take into account all stations that satisfy the scientific standards necessary, omitting those with inconvenient time series is what the denialists accuse the science quite frequently and falsley for. Thank you, Tamino! Speaking for myself, it’s gratifying to hear your authoritative voice on this issue. It’s hard to imagine a clearer signal, for any genuine skeptics who might hear it; one can only hope it doesn’t get lost in the din of denialism 8^(. A guy can dream, can’t he? IMHO, with the same caveats, Rahmstorf et al. 2017 is an excellent cite against eyeball “hiatus”; and even better against well-poisoning insinuations that climate scientists are “CAGW alarmists”, biased to find the GMST trend accelerating. Follow the link to “Met READER” (READER=REference Antarctic Data for Environmental Research), and there you’ll find all the data for all Antarctic stations. Here is an interesting tidbit. The graphs, which they still keep on their website, go only until 2012. Why did they stop, did somebody complained that it reinforces wrong idea? Tamino thinks Dan H is seeing pictures in the clouds, but he (and Gavin) are doing the imagining here. Fitting a linear trend to the data is a stretch at best. You get a standard error of 5.9 in a trend of 7 over a century – hardly convincing. @30 Nice conspiracy ideation there. They have maintained the data and even give clear links to it. There are any number of reasons to quit updating a website–most commonly human resource issues–that are quite benign. But you go right for the conspiracy! 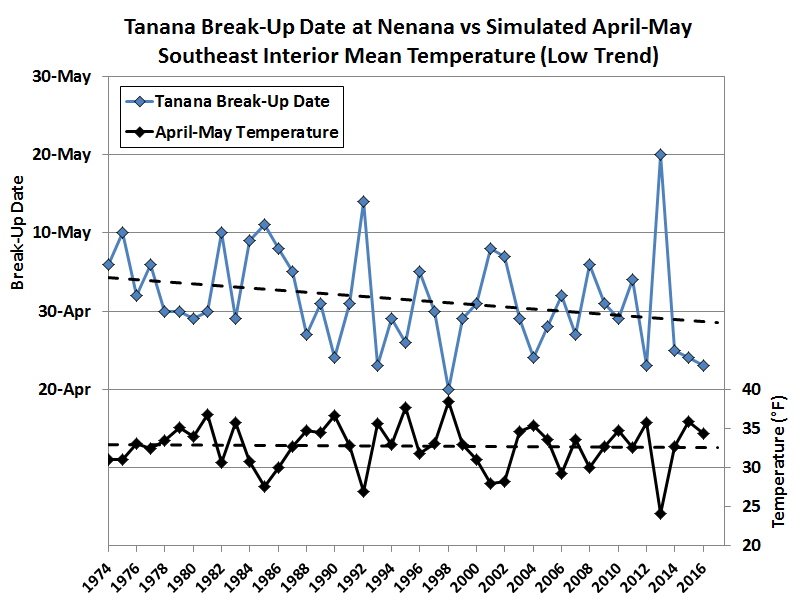 Much analysis has been done on the Nenana ice classic as a proxy for temperature change. They all show that the change in ice breakup date has occurred roughly between 1970 and 2000, and appears tied to spring temperatures and rains. For Tegiri Nenashi, did you click the link provided at the page you point to? If you are looking for info after 2012, that should help. They wouldn’t be helping you to find the current info with that link, if they were trying to hide it, I think. It is not clear what you are trying to suggest from these Antarctic datasets. The up-to-date data is available on-line, and you provide the link to that data. The graphs have not been maintained (last data 2011, not 2012) and the parent directory says as much. The un-graphed data post-2012 give the highest anomalies of any 4-year period, with the average rises for both datasets (those which you present links to their graphs @8) showing the temperature increases approaching 1ºC/decade since the turn of the century (although this does follow a smaller drop [c50%] over the preceding decades). Is this 1ºC/decade rate of temperature increase what you are suggesting is the reason for the stop in the updates on the graphs? Is this why you consider ” somebody complained that it reinforces wrong idea”? KW: Tamino thinks Dan H is seeing pictures in the clouds, but he (and Gavin) are doing the imagining here. Fitting a linear trend to the data is a stretch at best. You get a standard error of 5.9 in a trend of 7 over a century – hardly convincing. BPL: A straight line is the simplest fit. To add more complexity, you have to justify it statistically. If you think there’s a break at 1970, have you tested it? Have you tested other years near and far from it? What te4st did you use? A Chow test is conventional, but you have to be sure NOT to pre-choose your break point. What have you done to demonstrate your point above quantitatively? “The graphs have not been maintained”. And what does it take to maintain those graphs? The software has already been written. How complex is to run computer program? It can even be made a daemon process that requires no manual intervention at all. Let me clarify why antarctic temp dataset/graph is remarkable. The paper currently stands at 766 citations. Ignoring the WAIS fate claim, the other most notable scientific prediction of the paper is 5-10 degrees temperature increase above antarctic circle in the next 50 years (1978-2028). You are incorrect in saying it is a matter of simply maintaining a set of graphs. The parent directory tells us “This website will no longer be maintained.” It is a re-write of their website that has stopped the graphs in 2011. His name is Tegiri Nenashi. His previous sucess was a suit against PC display industry…. For those who do not know Japanese, Tegiri Nenashi is a joke name. Why bother with such an uncertain measure of the effects of climate change, when there are so many better measures. The margin of error for the blue line is probably very large. Commentators point to interpretation problems. It is just curiosity. BPL @ 37 the simplest fit is to leave the data raw. By fitting a line you are making an assertion that there is a time variant affect. But that effect, as I have shown, is on the same level as the standard error. But that is all irrelevant, I am not making any claim of a time relationship. Dan made an observation that was challenged by Tamino. All I have done is show statistically that Dan’s observation is closer to the data than Gavin’s linear interpretation of the full time sequence. 41 Hank Roberts shares some unexpected fascinating information. So if the poster used the nym “Whincemcgouglesqwallawallabionski” instead, what bloody difference would it make to any one? As Gavin briefly mentioned, and as seen in the links, the peanut gallery made a big deal of a single year with a late breakup, but somehow fails to mention the trend, leaving that chore to the adults in the room. Admittedly, Antarctica temperature increase in Mercer paper was from Manabe et.al. research (fig.1). Saltsman 2017 has indeed something new to contribute to the apparent polar amplification asymmetry, but let me ask more general question: Which climate research papers stood the test-of-time? Awarding distinguished past contributions is what other science disciplines routinely; perhaps this is a worthy topic for a post here? I infer that you imply my poor credentials (scientific, or otherwise). However, I would like to turn the discussion into positive direction and discuss a related idea: “citizens science”. There are many success stories there: “Folding@home”, “Galaxy Zoo”, etc. Climate science has a different flavor of “citizens science” (surfacestations, etc). Why is that? I note you fail to define the “time” in question. Further, you now appear to expand this questionable navel-gazing exercise to encompass the totality of “climate research”. I am tempted but these aspects of your questioning to describe why your assertion “Awarding distinguished past contributions is what other science disciplines routinely (do)” is as preposterous as your question. Perhaps if you could set out a more realistic question, it would be possible to usefully respond to it. Plenty of climate-related citizen science sites, e.g. You need to understand what an anomaly represents. Spring was early across much of the US in 2017, arriving 2-3 weeks earlier than a long-term average in the South, Great Basin, Great Plains, Midwest and mid-Atlantic. Many parts of west coast states and small portions of the east coast were 1-3 weeks late….